Bakeaway with Me: Cornmeal, Pistachio, Fig Biscotti and an Award! In my kitchen, there’s a tin that sits on my counter right next to my coffee maker. It’s always filled with biscotti! It’s the place where everyone seems to gravitate when they need a snack or something slightly sweet; to have with their cup of tea or coffee. Most biscotti are low in fat which make them a pretty healthy treat, too! Biscotti, in Italy, refers to any type of cookie. In the U.S., biscotti is the term used to describe a long, dry, twice-baked biscuit. In Italy they are served with (and generally dipped into) wines such as Vin Santo. In the U.S., coffee is the drink of choice, and with the popularity of coffee houses, came the rise to fame for the biscotti. Years ago, while my daughter was attending college in the East Village of N.Y.C., she was the summer RA (Residents Assistant) for her dorm. I would often go into the city for an overnight, and she would take me on field trips to some of her favorite places. One of those places was the Chelsea Market, where Amy’s Bread was located. The shelves in the bakery were filled with the most marvelous breads and cookies. My daughter and I would buy a few treats, to take back to the apartment; so that we could enjoy them with our tea and for breakfast the next morning. Amy’s Bread was incredible. Since then I have had a special fondness for Amy and her baked goods. A few years later, while reading the food section of the NY Times, I found a great recipe for a Pepper-Nut Biscotti from Amy’s Bread. As soon as I read the recipe I knew I had to make them. So, with a bit of enthusiasm and trepidation, I delved into making my first batch of biscotti. I was really quite thrilled with the the delicious results. Fast forward to 2012…I now make one of my many biscotti recipes every month. So in my little world of family and friends, biscotti has become my signature cookie! My most requested biscotti is still Amy’s Pepper-Nut! The recipe I’m sharing today is for a Cornmeal, Pistachio, Fig biscotti. This lovely recipe has such a wonderful flavor. I adore cornmeal in baked goods! The cornmeal in these biscotti make for a delectable cookie, with a perfect crunch! I don’t remember where this recipe came from but, you will surely love them! Preheat oven to 350 degrees. Line a baking sheet with parchment paper or a silpat and set aside. 1. Whisk flour, cornmeal, baking powder, and salt in a medium-sized bowl. Set aside. 2. Place the butter into the bowl of stand mixer and beat on medium speed until smooth. 3. Add sugar and mix on medium speed until light and fluffy, about 3-5 minutes. 4. Scrape down sides of mixer, then add eggs one at a time, and beat until well incorporated. 5. Add Grand Marnier and beat until combined. 6. Reduce mixer speed to low; add flour mixture in two batches until just incorporated. 7. On low speed; stir in figs and pistachios until well-incorporated. 8. Using a spatula, scrape dough out onto parchment-lined baking sheet in a log shape. You want it to be roughly 3 1/2 inches wide by 14 inches long. Use your hands to pat it into shape, if you need to. This dough is quite wet…dampen your hands to make it easier. Mine made 2 logs. 9. Bake 30-35 minutes, until lightly browned. 10. Remove from oven, place baking pan on a wire cooling rack, and allow to cool 15 minutes. 11. Lift biscotti log off of parchment onto a cutting board (do this carefully; if it is too hot, the log will crack in half). 12. Using a serrated knife, cut the log into slices on the diagonal about a ½-inch thick. 13. Place slices back onto parchment-lined baking sheet and cook for 15-17 minutes rotating sheet half-way through, until the edges brown. Allow to cool on a wire rack and Enjoy!! 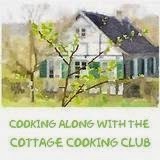 I want to thank Susan of Create Amazing Meals, for choosing my blog to receive The Food Stories Award for Excellence in Storytelling. I am so honored to have been chosen. Susan has a fabulous blog and I appreciate her support. I have found the nicest people in the food blogging world and I am so lucky to have many of them as my blogging friends! Now I get to share this award with 5 fellow bloggers! 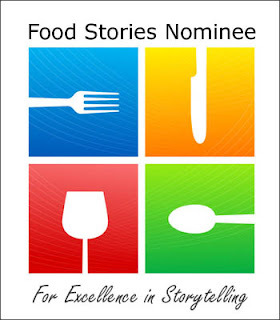 Food Stories is pleased to present the Food Stories Award for Excellence in Storytelling, a fabulous nomination that anyone can bestow on their fellow bloggers. 1. The nominee should visit the award site (http://foodstoriesblog.com/food-stories-award/) and leave a comment indicating that they have been nominated and by whom. (This step is so important because it’s the only way our judges will know who is being considered for the monthly presentation). 2. Thank you Susan! I am thrilled! 3. I collect cookbooks and own about 600! It’s an obsession!! 4. This one was so hard for me…I love so many of the blogs I visit. I would have loved to give an award to everyone of them! Here are the six I’ve chosen! mouth watering for these omg they look fantastic! Your biscotti look professional, and what a great combination of flavors. Congrats on your award! Congrats on the award! Yummy biscotti as well. Kathy, your Cornmeal, Pistachio and Fig Biscotti look wonderful and absolutely perfectly shaped! The photos are amazing - I would like one of the biscotti with my cup of cappuccino (with that heart), please! And thank you Kathy for nominating me for the "Food Stories Award" - as I mentioned in my reply to your kind nomination, I am already working on my blog post and the follow-up nominations. Hopefully, it will be all ready for posting within a day or two. Thank you again!!! Enjoy the rest of the week! Congrats on the award and the biscotti sound wonderful - such great flavors! The Biscotti looks fantastic. I love pistachio nuts, so I know the biscotti taste great!. Congratulations on your award. I always enjoy reading your blog. Love, your Cornmeal, Pistachio, Fig Biscotti. It turned out truly perfect, crunchy and super delicious. I do have figs, cornmeal, just no pistachio. I might have to substitute almonds instead...actually, may not be a bad idea! First off, congratulations on your award! I would be afraid to count my cookbooks,lol! I like the idea of a tin of biscotti next to the coffee pot, ready for visitors to your kitchen. I really like this biscotti recipe with cornmeal, pistachio, dried figs and Grand Marnier;-) I'm feeling like baking now! I thought it was great for Betsy!! Not a problem…it brought a smile to my face!! These are wonderfully unique and totally delicious. Of course you say pistachio and I appear. And then there's those figs - what a grand combination. Thanks so much for the award - very thoughtful Kathy! I don't post much but will acknowledge it - I don't tend to nominate people. I think that's from a lifetime of choosing at auditions - I hate leaving anyone out. I hope you understand. These biscotti with mixed fruit and cornmeal look divine. They look wonderful! I was surprised a few years ago when I made my first biscotti to discover that it is not difficult because I for some reason expected it to be. Now I want to go bake biscotti! :) Have a wonderful day! Oh the fond memories I have of dunking Biscotti in wine as a little girl. My grandmother always had a fresh batch of biscotti waiting for us when we visited her each and every Sunday during my growing years. I've never tried to make them myself. Congratulations to you for your Signature cookie and the award! Congrats on the award! Not really a fan of biscotti, but your photos are lovely! You are the biscotti queen, Kathy! I wish I could drop by your house to share a cup of tea and dunk some of these beauties!!! This is a great mix of ingredients, not sure if I have ever seen it in anything-very creative. They look picture perfect as well as enticing-fantastic recipe! Congrats on the award! The biscotti look amazing, I love pistachios and figs! I visited Amy's Bakery the last time I was in New York, and it was absolutely wonderful. Congratulations on your award, Kathy! Your biscotti looks wonderful and I enjoyed reading your memory of visiting your daughter while in she was in college. I hope you post Amy's Pepper Nut biscotti recipe sometime!